Have you ever struggled with a sin so large that you don't want to see anyone? You don't want to tell anyone your story. You're confident that you will take your struggle to the grave. You just want to hide in a corner and never come out. Well, you're not alone. Hiding when we've done something wrong is nothing new - it's actually part of the human condition. If we trace human history all the way back to the first man and woman, we see shame at play in the story of Adam and Eve. Genesis 3:8 says: "When they heard the sound of the Lord God walking about in the garden at the breezy time of the day, the man and his wife hid themselves from the Lord God among the trees of the garden." I know what it's like to hide from the Lord, ashamed of my sin. But after I've hidden from God, I start to hide from others in my life, too. I don't want people to see me in my messiness. In the past, I've worried that my story is too much for them to handle. Someone who is on the list of those who I run from when I'm covered in my sin is the Blessed Mother. I write about the subject of the feminine genius quite a bit, and I have a whole podcast dedicated to exploring what it means to live in today's world as a Catholic woman. I love diving deep into the heart of Catholic femininity. Each woman lives out the feminine genius in a beautifully unique way - but one woman lives out the feminine genius to it's absolute fullest, and that's Mama Mary. Her constant yes to the Lord is the ultimate exemplar of receptivity. Her beautiful, giving heart shows us how to be generous. Her awareness of the needs of others is an example of feminine sensitivity. She lives out physical maternity through the birth of the Lord, and is a model for spiritual maternity since she sees each and every one of us as her children. So when I struggle to live out the feminine genius, when I stumble along the path to holiness, I hide from Mary. My shame has kept me from getting close to her. I used to think "Mary is so beautiful and good, why would she even want to get close to my ugly messiness? I'm too messy for them." In this struggle, a story I have found incredibly helpful in the healing process is the story of Mary Magdalene - a story shared with my by Sarah Burns of Little Tabernacle. We don't know much about this woman in Scripture. Really, all we know for sure is that Christ released her from seven demons. When Christ frees Mary, He redeems her entire story. She goes from possession by seven demons to living a life of unbridled joy, pursuing the Lord and following in His footsteps. Can you imagine what could have been going through Mary Magdalene's head when she met Our Lady? Mary Magdalene's life was riddled with mistakes. Shame could have easily gotten the best to her. 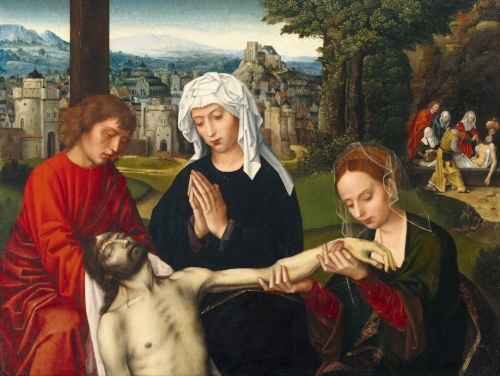 But where do we find Mary Magdalene during Christ's passion? At the foot of the cross. And who is she standing with? Our Lady. Mama Mary isn't condemning Mary Magdalene, or shaming her for her past life. Instead, she invites Mary to stand next to her and supports her. What a beautiful example of feminine compassion, love, and mercy in the Blessed Mother's heart. I love this image from The Passion - a moment where Mama Mary had ever right to break down, collapse, and sob. Our Lord was on the way to the cross - her son, on His way to die for all of humankind. But Mama Mary, in an absolutely beautiful moment of feminine genius, draws Mary Magdalene to herself and is sensitive to her needs. She pulls her close and cries with her. Maybe you, like me, struggle with shame. Perhaps you too have a tendency to want to hide from the Blessed Mother in your messy moments. But the next time you feel like your story is too much, run to the Blessed Mother. Saint Alphonsus Liguori writes beautifully about what we can do in times of shame. "Since Mary is this auspicious light, created for poor sinners, what should people do if they find themselves in the darkness of sin? Let them cast their eyes on the moon. Let them pray to Mary." Shame can't survive when it is washed with empathy and understanding, which is exactly what Our Lady wants to offer us. Mary, hope of sinners, lead us to the feet of your Son.